Precedent of Justice begins with a court scene. The jury had reached a verdict. The crowd held their breath as they listened. The verdict shocked everyone present in the courtroom except the defendant. The judge dramatically left the courtroom ending a stellar career. Bobby Dizorno wickedly grinned. It was not over, yet. It was really just beginning. The LeFluers were brutally murdered. The killer stabbed the sleeping couple in the heart and mutilated their bodies. Detective Charlie Peppers was assigned to the case. He and reporter Nancy Raults unite to investigate the murders. As Charlie reports to the Chief, he notices something is not quite right. The Chief seemed to be under stress or pressure. Vital evidence came up missing. Then another murder is committed. Precedent of Justice by Patrick R. Raley is an excellent read. There are enough unexpected twists and turns in this mystery to keep the reader on the edge of their seat. This is a page-turner; I could not put it down until I had read every word. Unfortunately, this book still needs some editing. Anthony and Mary’s love is heartwarming and brought tears to my eyes. The slowly budding romance between Nancy and Charlie was delightful. This book has a surprise ending. Fans of mystery will not want to miss Precedent of Justice. Suspense, mystery, a touch of romance, and a whole lot of murder and secrets are what this story is all about. When the wealthy Lafleur couple's murder was committed, Detective Charlie Peppers' life and career drastically changed. He was put on the case to find the murderer and the motive. It seems a lot of people had financial or business ties to the Lafleur's; but who would go so far as to murder them in cold blood? Nancy Raults a reporter for the Times wanted this brutal story more than anyone, it is a good thing she had an informant that supplied her with the information she would need to find the Lafleur home. After throwing up dinner on the Lead Detectives shoes upon seeing the bodies, Nancy had no idea how close later down the road they would become. It could possible cost them both of their hard earned careers. An obviously guilty man knew which strings to pull and favors to call in when he was arrested and tried for murdering the Lafleurs. When the murder weapon along with the other evidence came up missing and Mr. Dizorno was proven innocent; at that moment the crap hit the fan. All the secrets that the guilty parties were harboring would soon leak out. With the help of someone Charlie trusted most, the murderer would be brought to justice. The sad thing is the murderer was actually guilty of the first crime committed but innocent in the second accusation for another murder. How you ask? It is jaw dropping and heart pounding when the truth finally comes out. Mr. Raley had my full attention from the very start. This story should be made into a movie, it would be topper on the box office charts for sure. Great detail and believable events proves that Mr. Raley has the skilled hands of a talented writer. When I got to the very last chapter of this book, my jaw literally dropped, a surprise ending caught me completely off guard. This is a 5 heart review all the way! 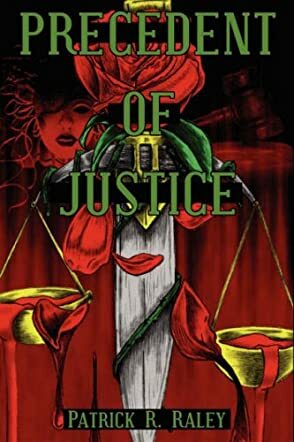 Mystery/Suspense lovers out there need to add a copy of Precedent Of Justice to your library. Raley's work, Precedent of Justice, takes you to a dark place that everyone fears to tread but so willing ventures. An emerging partnership within the story illuminates this dark place by turning suffering into human triumph. The story is filled with great detail. His characters have depth and a believability so intense that you feel like you may have met them in a past life. The struggle between good and evil, humanity, and suspense all weaving throughout the plot to create a classic murder mystery. Buy this book! I consider myself an avid reader. In the process I've picked up many books and found the story lacking depth. Sometimes I wish the author would spend more time developing people instead of just plot twists. I think that's why I loved this book so much. I felt like I knew each character as I read and learned about them. Also the story kept me guessing. The ending definitely blew me away. I thought I knew for sure how the story would end. It's scary to think that minor technicalities can set guilty people free, but I know it does happen. Now I understand just how easily criminals can abuse our justice system. The story grabbed my attention from the very beginning. I found myself asking a thousand questions after just the first three pages. As I read and found the answers, many more questions replaced them. Definitely a quick page-turner. I hope they make a movie out of this one. It would be a blockbuster. For anyone looking for something that breaks the mold of the regular old mystery/thriller, this is the book for you. Just don't take my word for it though, get it youself and see. I can't wait for the next one. Precedent of Justice is definitely worth the read. I found that I couldn't put the book down until I finished. The story moves briskly as the relationships between characters richly develop. The who book was interwoven with honest heartfelt relationships and unexpected twists and turns that kept me in the pages. The ending was definitely a surprise I didn't see coming. Anyone who loves mystery does not want to miss out on this author. I just wonder when the next one will come out? When the book "Precedent of Justice" arrived at my home and I checked out the Table of Contents for this 285 page novel and it features 68 chapters it gave the appearance of a book published at home. I was willing to give the book a chance, so I started plowing through it. All along the way there were countless typographical errors, missing words, and numbers littered within words i.e. : use3less, which detracts from the quality of the book. The story is not bad, just not my cup of tea. I am not a fan of romances, but rather courtroom suspense, so I was rather disappointed that it was mostly the former rather than the latter. I was able to get the entire book read, but would not recommend it to anyone.